Turkish President Recep Tayyip Erdogan and Russian counterpart Vladimir Putin on Monday warned that U.S. President Donald Trump's recognition of Jerusalem as the capital of Israel risks escalating tension in an already tense region. 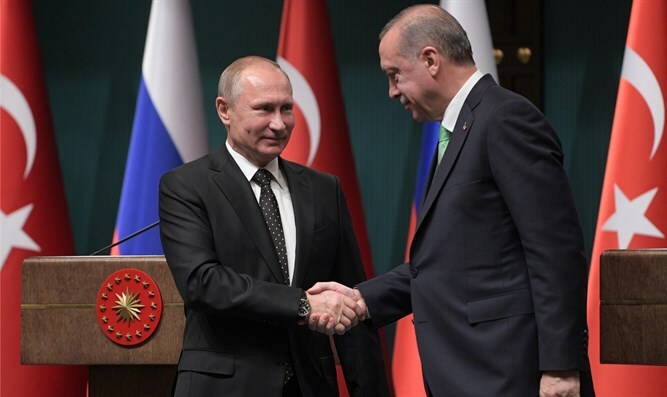 "Both Russia and Turkey believe that the decision... does not help regulating the situation in the Middle East but instead destabilizes the already complicated atmosphere," Putin said at a press conference in Ankara with Erdogan, according to a report by the AFP news agency. "It can derail the Israel-Palestine peace process," he warned after his meeting with Erdogan following lightning visits to Syria and Egypt earlier on Monday. Erdogan said that he and Putin had taken a similar approach on the issue as he took advantage of the situation to accuse Israel of continuing to "add fuel to the flames". "Israel is using this as an opportunity to further increase the pressure and violence against Palestinians," he charged. Erdogan has stepped up his anti-Israel rhetoric in recent days in the wake of Trump’s announcement on Jerusalem. On Sunday, Erdogan said he would fight against Trump’s controversial declaration, describing Israel as a "terrorist state" that kills children. "Palestine is an innocent victim... As for Israel, it is a terrorist state, yes, terrorist!" Erdogan said in a speech in the central Turkish city of Sivas and added, "We will not abandon Jerusalem to the mercy of a state that kills children." Prime Minister Binyamin Netanyahu later fired back, calling Erdogan a leader who bombs Kurdish villagers and supports terrorists. On Monday, the Turkish president said the "struggle" of Muslims would not end until there is an independent Palestinian state. "They will never be able to clean the blood," he said in a speech in Ankara. "With this recognition of Jerusalem as the capital of Israel, it (the United States) has become a partner to this bloodshed. We do not recognize this decision, we will not," he added. He added said that the current "vandalism and cruelty" in Jerusalem would not last. "Those who think they own Jerusalem today will not find trees to hide behind," he said. On Saturday, Turkey’s foreign ministry condemned what it called Israel's "excessive" and "disproportionate" use of force against Palestinian Arabs who protested the U.S. decision to recognize Jerusalem as Israel's capital. Erdogan had previously warned the United States not to recognize Jerusalem as Israel’s capital, or to move the embassy in Israel to Jerusalem, saying that any change to the status quo vis-à-vis Jerusalem would constitute a “red line” for Muslims. He also threatened that his country would sever ties with Israel if Trump went through with the move.